Click on this photo to go to our flickr account. Merry Christmas everyone and Happy New Year. We were blessed to get so many great photos at this photo shoot. This picture is priceless. 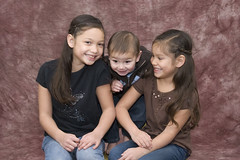 I love that the kids are used to having their pictures taken and cooperate most of the time. Gavin absolutely loved the snow. 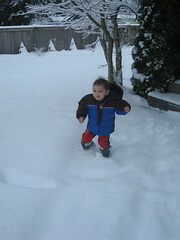 Click on this photo to see more snow pictures and sledding with Uncle Caleb in my flickr account. Today we met a whole bunch of friends at Tiffany's to go skating. 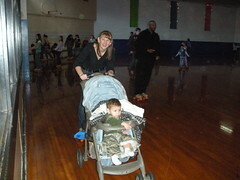 I was so excited to find out that they let strollers go around the outside of the rink. Gavin was so good. The girls were getting really good at skating by the time we had to go. We have a family tradition to open up one present on Christmas eve. 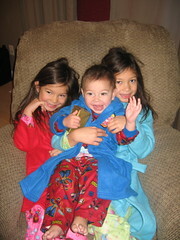 The kids all got to open up their new jammies. 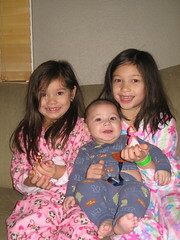 This is them on Christmas morning in their new jammies. 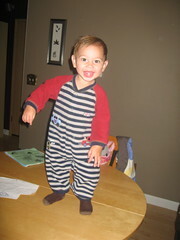 On this particular day he had managed to fall at Grandma and Grandpa's and bonk his head. Later he tripped in my room and you can see the scrape he got from landing on a drawer he had opened moments earlier. Finally he pulled his sweatshirt that was attached to a chair until the chair toppled down on top of him. Good thing we have insurance. 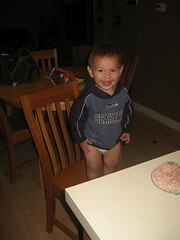 Any suggestions on how to keep the boy off the table? We are constantly pulling him off of the table. And I thought Elyse was mischievous. He just looks like mischief, doesn't he? 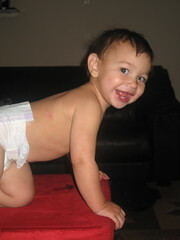 He was so proud of himself when he learned how to climb up on our chairs. 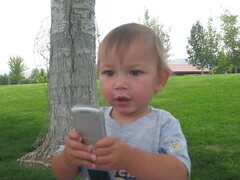 Gavin sent his first text to daddy when we were visiting the Allen's in Wenatchee. Gavin texted ...! to Edwin and he called back quickly to say "I didn't do it!" Judy and Jazzy came this summer to celebrate Grandma's birthday. 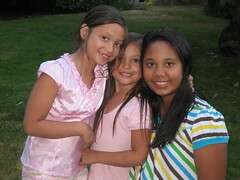 It is so fun to see our beautiful girls together. 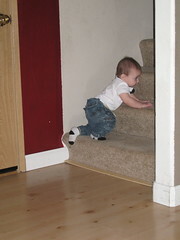 Gavin couldn't walk yet but he could climb to the top of the steps. 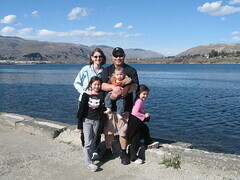 Over Spring Break we had the opportunity to go to Wenatchee for a few days to stay with the Allens. We had a great time. We went to Cloud 9 and played at the park by the river. It is always good to see our friends. 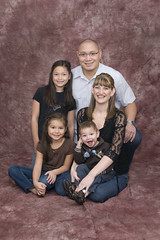 I know it has been a long while since I posted to our blog. As many of you may know, I was in a car accident on November 30th. I ended up eventually missing 2 months of work in order to let my back and neck heal. I have been back to work for 3 weeks now. 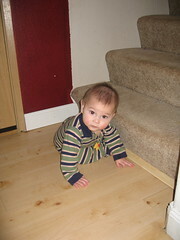 Gavin started crawling just as I was ready to go back to work. God is good. He knew what I could handle. Many people from the church helped out while I was recovering. 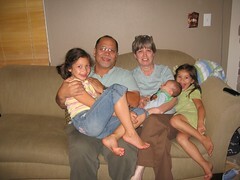 My mom was my shadow for two months because I was unable to hold Gavin or do basically anything. Edwin was an awesome help and whipped the girls into shape. I am so thankful that I am getting back to normal. I am still going to physical therapy twice a week and have aches and pains but feel grateful to be on the road to recovery. 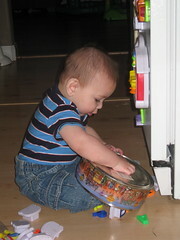 It is fun to watch Gavin occupy his time playing with toys and other items. The container is more exciting than the letters that go inside. 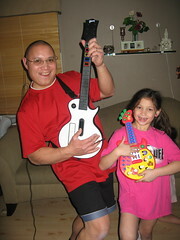 Edwin got Guitar Hero for Christmas and the girls think it is fun to watch daddy and to sing some of the songs. They know almost all of the words to "Hit Me with Your Best Shot". We started a tradition several years ago. Everyone gets to open new jammies on Christmas eve. The girls are enjoying being big sisters. Hopefully you received our Christmas card before Christmas! 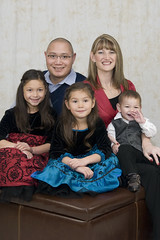 I was unable to send a letter with our Christmas card this year but decided to include our blog address. You can see what we've been up to throughout the year by scrolling/reading through our blog. We are looking forward to celebrating Christ's birth and spending time with family and friends. We hope you are able to do the same. 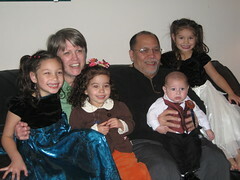 We had Thanksgiving at our house this year with the Arceo family. We had so much fun and lots of food to eat. There are more photos on the Flicker account. In case you hadn't heard. Our horse lover took a dive off the horse while riding at the fairgrounds. The medics were called, as Grandpa was concerned with the gash on her forehead. They cleaned her up and luckily I was able to leave school early. She seemed to be fine until about 2 hours later when Aliyah barely bumped her arm and she began crying. I turned her wrist over to find her arm bruised and swollen. So, off to the doctor we went. She had to wear the cast for four weeks. Boy did it get stinky. Edwin wrote "Take me off, I stink" on her cast before it was taken off. Thankfully she is as good as new and would love to ride again as soon as possible. We enjoyed our visit/business trip to California. We had fun hanging out with Josh and Heidi. Yes, the girls wanted to be princesses again. If you are wondering, Gavin is a hot dog. 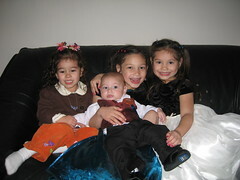 They all won a gift card at the Harvest Festival at The Skatin Station. 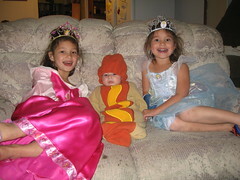 The girls for their pumpkins and Gavin for his costume. The girls are always trying to sneak in when I'm taking pictures of Gavin. 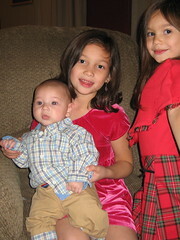 They love their brother and to be in photos with him. 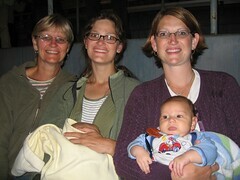 Nicole, Mom, and I had a great time at the Mercy Me concert with the boys. Aliyah wlll always have a special place in her heart for her Uncle Joshua. It was really good to have him here for a visit. We got to meet his wonderful girlfriend Heidi and enjoyed our time together. 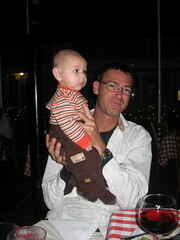 Edwin and I are looking forward to meeting up with them when we head to California for a few days in November. Nicole and Mom did a better job taking more photos. I'll have to get more from them. 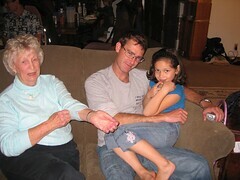 Grandma Kerri, Grandpa Frank, and Grandma Ruth came over for a visit. We always enjoy seeing them. 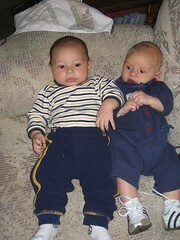 They posed for a photo and even Frank even battled against Edwin on his new Wii.